Bowling All Rounder: Right Arm Leg Break - LH Lower order bat. Jake is a lively, competitive and ambitious and as a player always thrives under pressure doing all he can to ensure that his team are successful both on and off the field. Jake is a good club player and is a good face to have in the changing room, always willing to speak his mind about any game he is involved in. Jake is also a Level two coach, he is always willing to help those keen to learn as well as improving his own game. Jake desires to make it as a professional cricketer in the future and has been part of the Essex Academy set up and recently made an appearance as 12th man in the County Championship before moving to Hampshire where he made his second team and ListA debut against Sri Lanker A for the first team! 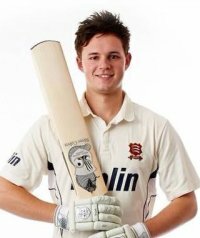 Jake has also broken into the minor counties set up and hopes to be representing Wiltshire CCC in the upcoming season in both One Day and the Three Day comp. He will yet again be playing for South Wilts Cricket club in the Southern premier league hoping to retain the League and T20 trophies in 2015. Jake will be taking part for the MCC in his second year after being placed on the elite players list during the early months of 2015. Recently joining Southampton Solent University Jake will be playing in the top BUCS league against strong Loughborough and Durham oppositions. Jake is into his third season with Simply Cricket. 2015 is one that promises a lot so make sureyou keep up to date with his progress! • U15 Essex youth player of the year, finishing as leading wicket taker. • Runner up in the U18 sports personality of the year awards in Colchester. • Recorded the most runs in a year at Holmwood House School at the age of 12. • Won Great Bromley's Youth player of the year and 1st XI batting award aged 16. • 12th Man for Essex in several County Championship games 2014. • SouthWilts youth player of the year 2014. • Hampshire second team debut Vs Somerset 2014. • Hampshire first team and ListA debut Vs Sri Lanker A. • Winning southern premier league and T20 with SouthWilts.